Today behold Dungeon Hunter Champions made by the giants Gameloft. And we all know that this publisher is making really good games. Not in a “WOW” way, but pretty satisfying. And I am very pleased to make a review on this RPG game. And not only RPG game this is “hack and slash, RPG, kill everything that moves ” game. Honestly, this is one of my favorite kind of games. One of the most popular mobile hack-and-slack action RPG franchises is back and bigger than ever in Gameloft’s most ambitious title to date. Dungeon Hunter Champions raises the stakes by adding both PvE and online PvP modes, including an all-new MOBA-like 5v5 mode. The game has a ton of content, but just how much is hidden behind the freemium barrier? Dungeon Hunter Champions feels a lot like previous games in the series. You control a single champion, either fighting solo or with a team of up to 5. You can switch between the members of your team at any time, as long as they’re still alive. Told you that this is as simple as it gets. This game is something that should be like a blueprint for any other publishers that want to make a “hack and slash” RPG. And now I will tell you why! The controls are pretty standard. There’s a virtual control pad on the bottom left of the screen and action buttons on the bottom right. Each champion has up to 4 unique abilities, and some have a fifth passive ability. These can range from healing spells to crowd control abilities to good old fashion punchin’. Each ability (except for basic attacks) has a cooldown, so you have to choose when to use them carefully. If you’re tired of mashing buttons, you can toggle an auto-battle mode on and off in-game. This is handy if you want to max out your champions because it takes a lot of grinding. The AI also does a good job dodging enemy attacks, and you can still give some commands like choosing which enemy your team should focus on by tapping them. In more challenging battles, you can also slow the action down to half speed. This gives you more freedom to control each character’s abilities, though personally, I think the game is more fun at full speed. Although the controls work well, I found myself turning on auto-battle every time it was available. The team seemed to do just fine without me. The game is ambitious, but ultimately a lot of the content feels the same. The 5v5 MOBA battles don’t feel unique or competitive, and there isn’t much reason to play it other than resource grinding. It’s definitely no mobile esport. 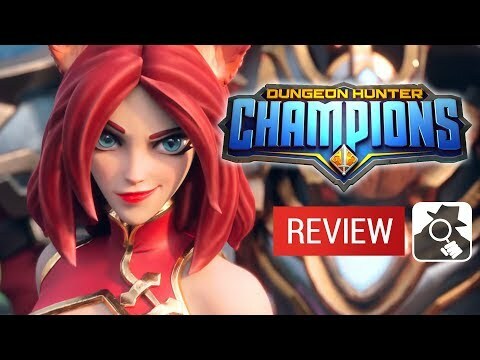 It’s easy to recommend Dungeon Hunter Champions. It’s free, so why not give it a shot? Just temper your expectations and buckle yourself in for an endless grind.